Overview - A black soldier is killed while returning to his base in the deep south. The white people of the area are suspected at first. A tough black army attorney is brought in to find out the truth. We find out a bit more about the dead soldier in flashbacks - and that he was unpopular. Will the attorney find the killer? There are many different types of conflict, but few are as potent as racially charged tension. Such division can serve as strong dramatic fuel, setting off fires of emotion that rage internally and externally. While the sides are often clearly delineated, the cruel realities of bigotry aren't always so cut and dry, and hate can sometimes come from rather unlikely sources. Norman Jewison's 'A Soldier's Story' presents such a scenario, forging a murder mystery that is far from black and white. Led by a strong ensemble cast and an engaging script, the film is an effective but slightly uneven drama that succeeds despite a few minor stumbles along the way. Adapted from the Pulitzer Prize winning play, the plot revolves around the murder of a black sergeant (Adolph Caesar) in a Louisiana army base during WWII. Local clansmen are suspected and a military attorney, Captain Davenport (Howard E. Rollins Jr.), is sent in to investigate. 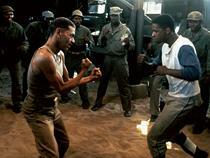 Also black, Davenport is met with some skepticism by the white military officers and racial tensions ignite. After developing doubts about the presumed identity of the murderer, Davenport starts to interrogate the deceased sergeant's men, leading to interesting revelations about the victim's questionable character. As the pieces of the puzzle slowly come into place, it becomes clear that the murderer must be a fellow soldier. Though the most probable culprits lie within the base's white population, the actual truth might be far more complicated than anyone could imagine. The plot is mostly structured as a series of interrogations that then lead into various flashbacks. Each story from the past gradually builds a bigger picture, revealing the truth behind the murder. Davenport's interactions with the white and black soldiers throughout his investigation also drive the plot, elaborating on various themes dealing with racism and acceptance. An uneasy alliance that develops between the lawyer and a white officer, Captain Taylor (Dennis Lipscomb), is particularly engaging with a nice blend of humor and heart. The key to the entire film rests within the true nature of the murder victim himself, Sergeant Waters. A complicated man with dubious morals, his personality and harsh worldview are slowly shaped through the recollections his men share, painting the picture of a proud, but often cruel man. Most disturbing of all is a potential undercurrent of self-loathing that causes Waters to lash out in racial tirades against his fellow black soldiers. This becomes the story's most interesting and complicated component, treading murky waters other racially charged dramas seldom explore. While the ensemble cast is strong (including a notable turn by a young Denzel Washington) there is a certain old fashioned approach to the performances that clashes slightly with some of the more heady sensibilities of the script. Under Jewison's direction, the characters sometimes lack subtlety, with acting choices often veering toward broad strokes rather than smaller nuances. On that same note, there is a fairly light touch to the picture's tone that can feel out of place when switching to the script's more serious aspects. An overbearing and occasionally outdated score doesn't help matters much either, with the impact of some important moments lessened by music cues that feel too on the nose. The episodic nature of the plot can be hit or miss as well, and some flashbacks are much more compelling than others. With that said, these criticisms aren't major and thankfully, the film gains great momentum as it goes along, successfully capturing the viewer with its mystery. Several scenes carry great emotional weight and though Jewison's visual style leans toward a purely functional aesthetic, there are some powerful cinematic moments. One very key monologue from Waters is particularly memorable. As the sergeant recounts a particularly unsavory story in a bar, the lights in the background dim, causing the world around the character to literally fade away. The image of an angry man alone in darkness emphasizes his isolation and troubled emotions, enhancing the dialogue in a visually meaningful way. 'A Soldier's Story' doesn't quite reach classic status, but it is definitely a well crafted film. Certain aspects of the episodic structure and broad tone feel a little uneven or out of place, but the film's complicated mystery and strong writing overcome these small flaws. Its story of racial conflict is both thought provoking and brave, revealing some unsettling realities that should leave viewers with a lot to ponder. 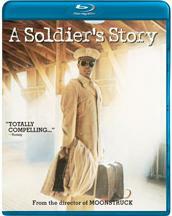 Image Entertainment brings 'A Soldier's Story' to Blu-ray on a BD-25 disc housed in a keepcase. After some logos and warnings the disc transitions to a standard menu. The packaging indicates that the release is region A compatible. The movie is provided with a 1080p/AVC MPEG-4 transfer in the 1.85:1 aspect ratio. Free of any unnecessary digital processing, this is a great example of a catalog title done right. The print is in great shape, with no major signs of damage. A moderate layer of grain is visible throughout, giving the image an authentic filmic appearance. Clarity is great with some nice fine details on display, rendering every bead of glistening sweat on the soldiers' faces. Colors are realistic and a bit drab, reinforcing the hardships of army life, but there are splashes of vibrancy in outdoor scenes that do pop. Daytime sequences carry a nice, bright quality with intense whites and nighttime scenes reveal consistently inky blacks (though shadow detail does seem to crush just a hair). Darker shots tend to look a little flat, but most of the film offers a pleasing sense of dimension. While I won't exactly be rushing to pop in 'A Soldier's Story' to show off my TV anytime soon, there is no denying the strength of this transfer. The content itself is visually modest, but still impressive in its own right. Seemingly faithful to the filmmakers' intentions, this looks exactly like it should. The audio is presented in an English LPCM 2.0 track with optional English SDH and Spanish subtitles. Though only two channels, this is a surprisingly robust mix that suits the content very well. Dialogue is clean and full with no signs of hiss, crackle or pop. Effects and score are separated nicely across the two channels of audio, making the most of an inherently small soundstage. In fact, this is actually a very lively track and several scenes (including a baseball game, army training exercise, and several sequences set in a bar) are absolutely bustling with stereo activity. While I found the score to be a little annoying at times, there is no denying its technical strength, and every note comes through with crisp fidelity. A few musical performances (featuring the great Patti LaBelle) are especially impressive, demonstrating wide dynamic range and even some booming low end. Bass activity also kicks in with some sporadic gunshots. Balance is good, but dialogue can sound just tad low compared to score and effects in some instances. Much like the video, the audio is authentic and technically proficient. Though the track of course lacks the benefits of a 5.1 mix, the 2.0 presentation is still great, offering nice, full-bodied sound. Unfortunately, we get absolutely nothing here. Not even a trailer. 'A Soldier's Story' is a solid drama that delves into some thought provoking territory. Though the flashback structure can be hit or miss and certain plot points don't land as hard as intended, the majority of the film works well enough. The video and audio presentations aren't exactly demo material, but they are faithful to the filmmakers' intentions and offer a great example of a catalog title done right. Unfortunately there are absolutely no supplements. Still, the movie and technical presentation are strong enough to warrant a look.